רמי 500 – game rules. Gameplay – see how to play רמי 500 on GameDesire! Have fun and play the game! Rummy is a game that originated in the beginning of the 20th century and it is most likely based on the Mexica game ‘Conquian’. Conquian, on the other hand, is based on the Chinese game ‘Khanhoo’ and if we keep looking back, it could have roots in ‘Mahjong’. Rummy has several variants and it can be played with several decks of cards, it all depends on how many players are playing. There is no limit for how many players can participate, you just have to use the number of decks required for the amount of players participating. It has been said that Rummy is one of the most popular card games in the world, right after poker. 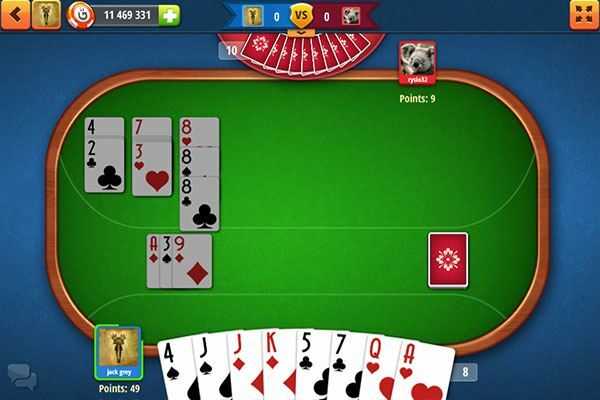 Rummy 500 is a variant of Rummy, it is played until one player reaches 500 points. The game described here is designed for 2 players. The main goal of the game is to be the first to get 500 points. Positive points are gained by melding cards. 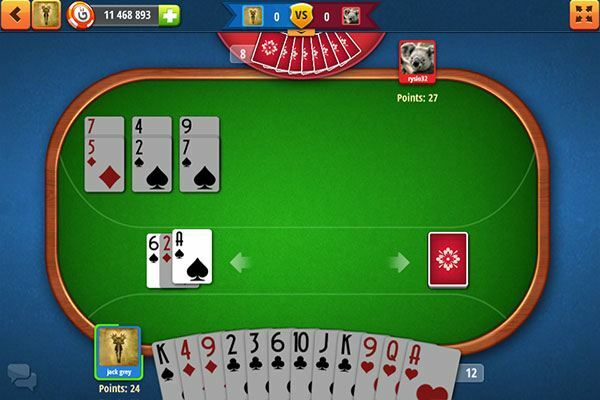 Negative points are received for any remaining cards left in the player's hand at the end of each deal, (when the opponent has gotten rid of all his/her cards). 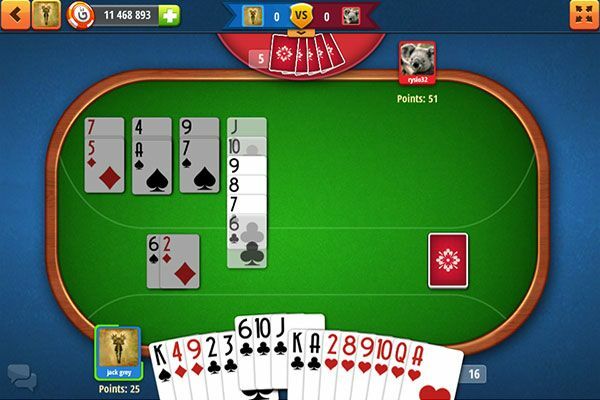 To begin, each player is dealt 13 cards. The remaining cards from the deck are placed face-down and form the stock pile. The top card of the stock pile is turned over and is then used to start the discard pile (the cards in the discard pile are face-up). The game begins by one of the players drawing a card from either the stock pile or from the discard pile. The main action of the game is melding sequences and groups of cards of the same rank. Sequences must consist of at least 3 cards of the same suit in consecutive order, for example: Q♥, J♥, 10♥ . Groups must consist of at least 3 cards of the same rank, for example: 2♥, 2♣, 2♠. and discarding one card to the discard pile. If a player draws from the discard pile, they can take one or more cards. If a player takes one card, they cannot discard that card to the discard pile during that turn. If a player takes more than one card, they must meld the last of the cards immediately. So the player can take from the discard pile the amount of cards needed to complete the meld. 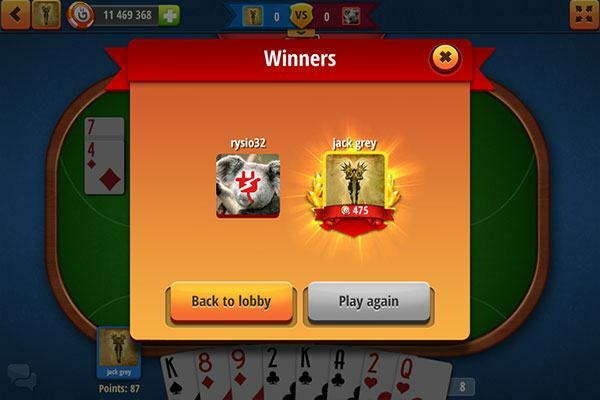 In Rummy 500 players have common melds. In other words, they can add cards to those melded by their opponent. Positive and negative points can be earned in the game. The cards from Nine to Two= the number of points is the same as the cards' values(for example: 9=9 points,8=8 points..and so on). Negative points are received for any remaining cards left in a player's hand at the end of the deal (after the other player has gotten rid of all their cards). The game is over when one of the players gets 500 points. If both players reach (500 points) after the same deal, the winner is the player who has the most points.